Wait. Aren't we talking about these Suède? Stop! Non stiamo parlando di quegli Suède, vero? Of course we don't! 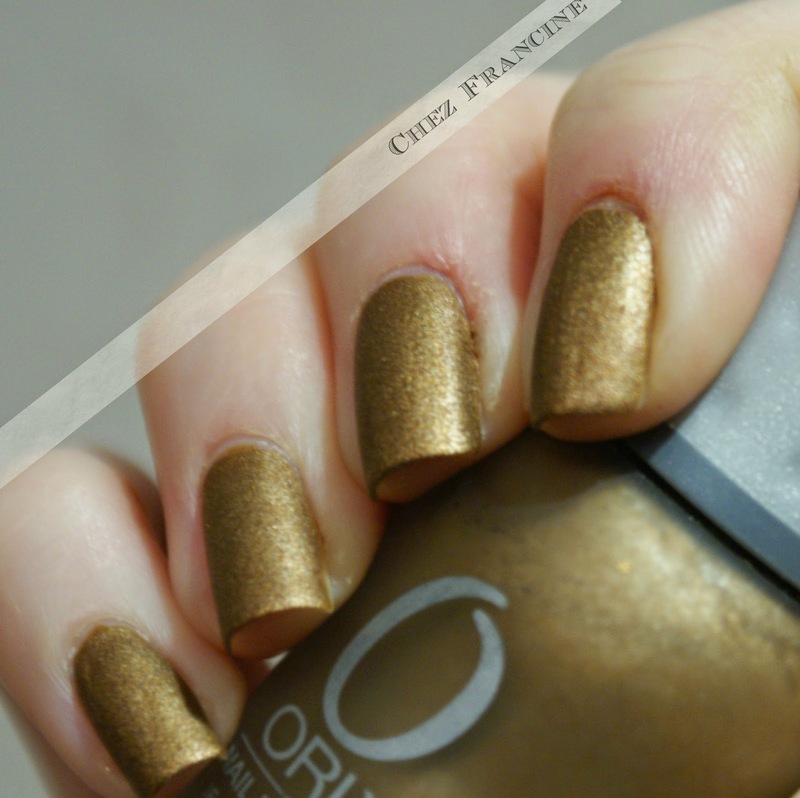 But today we are talking about the beautiful ones among nail polish finishes: Suède! 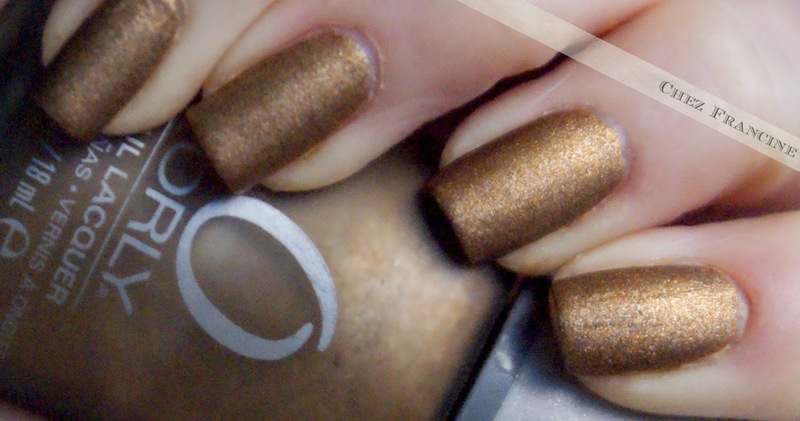 A suède nail polish is, basically, a mattified shimmer. That's all, Folks. Very simple indeed. A suède finish has glitter OR shimmer on it, like a every shimmer on this planet, but it is his mat version. They are easy to spot among finishes because they are just like shimmer, but opaque. Easy, it isn't? Certo che no! Ma oggi parliamo lo stesso dei belli belli in modo assurdo tra i finish esistenti: gli smalti suède. Uno smalto suède è, in parole povere, uno shimmer opacizzato. Ha tutte le caratteristiche dello shimmer, con micropolveri in sospensione e a volte anche dei glitter veri e propri, ma opaco. Sono facilissimi da riconoscere proprio per il loro essere così simili agli shimmer che non ci si può sbagliare. 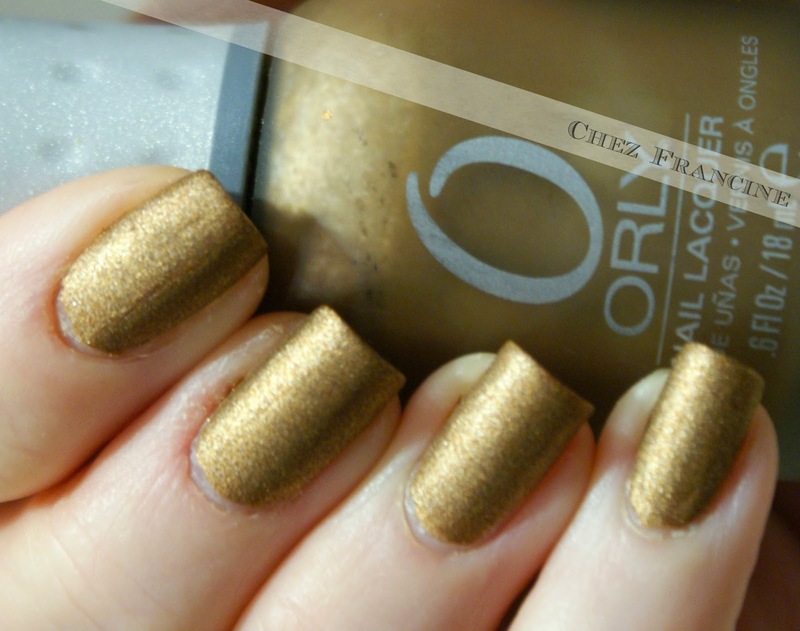 Orly Solid Gold is part of Orly's Metal Chic Metallic Matte Collection (Fall 2009). It's an antiqued gold, with a little hint of red. The formula is perfect (since 2009!) and the brush is failproof. This kind of finish doesn't deserve any tip, just remember to clean up your nail with some drops of vinegar before doing your manicure. Using a grip base, like essence's 24/7 or Nfu Oh's Aqua Base is not necessary, but it will be very very helpful. 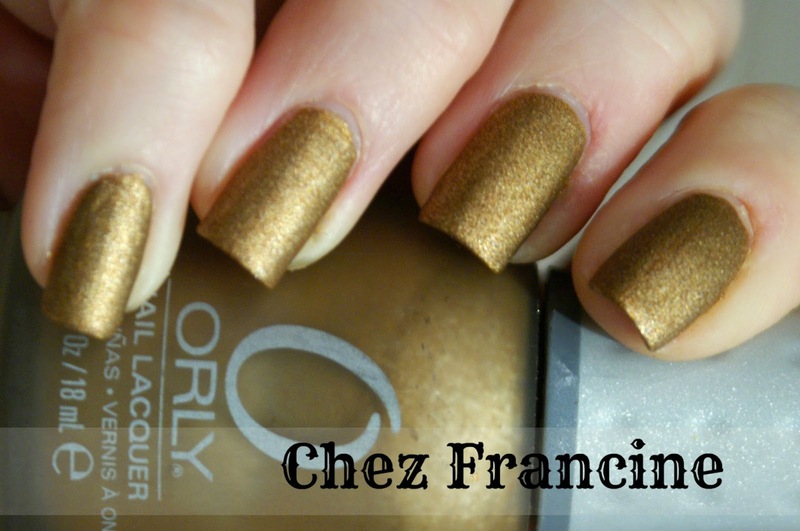 Orly Solid Gold fa parte della Collezione Metal Chic Metallic Matte uscita nell'autunno del 2009. Il colore è un oro antico, con un goccio di rosso. La formula è ancora perfetta e il pennello a prova d'errore. Un trucco per far risaltare il finish è quello di sgrassare le unghie con qualche goccia di aceto da tavola prima di iniziare la manicure. Se poi usate una base grippante come 24/7 di essence o Aqua Base il lavoro sarà ancora più semplice. 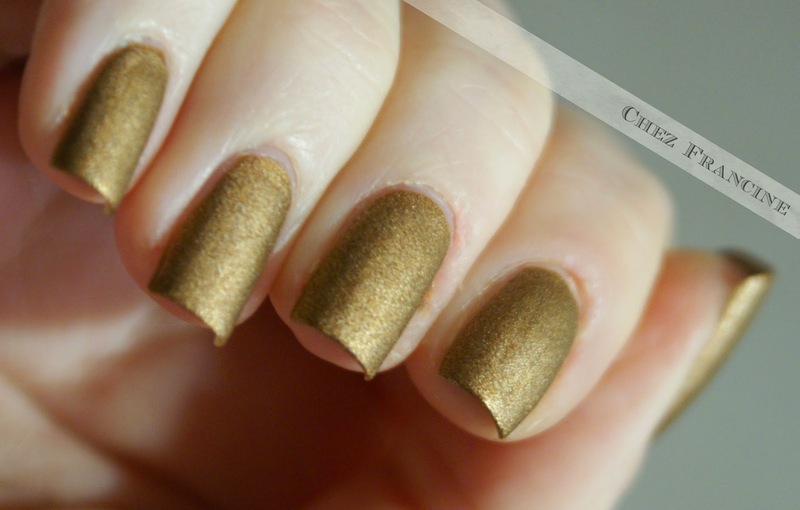 I love this finish, because it reminds me a velvet effect (but I HATE velour or flurry or velvet nails). It's highly tactile, don't you agree? And this kind of finish dries very fast. Lovely! Do you love Suèdes? The finish, I mean. Ok, do you love the finish AND the rock band? Let me know about it in the comment form! Today we have had a pounding rain with the sun (I think there has been a fox marriage, in the neighborhoud), but after that, we have had the chance to see a double rainbow arc over our house! We only miss the pot of gold. Did you see it, perhaps? I wish an happy week end and don't miss my mates's picks. Thanks for stopping by! Adoro questo finish perché mi ricorda l'effetto del velluto (e detesto con tutta l'anima l'effetto velour, invece). È estremamente materico, non trovate? E asciuga a vista d'occhio!! Vi piace il finish Suède. E gli Suède? Lasciatemi un commento qui sotto, sapete quanto io sia curiosa, no? Oggi c'è stato un bell'acquazzone col sole (si sarà sposata qualche volpe nel quartiere? ), ma alla fine abbiamo visto un doppio arcobaleno sopra casa. Mancava solo la pentola piena d'oro. Non è che l'avete vista, per caso? Non dimenticate di fare un salto a trovare le mie amichette! Non vorrete perdervi i loro suède, vero? Grazie per essere passate e buon fine settimana!